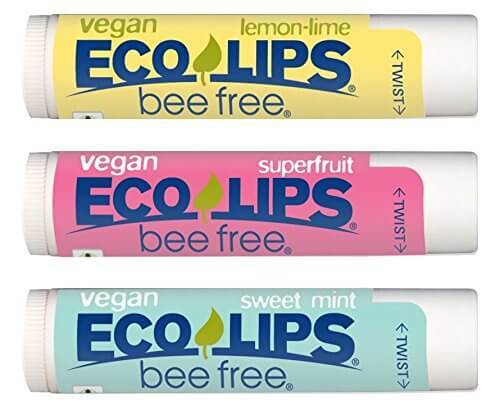 Eco Lips is a popular lip balm made specifically to be vegan-friendly. Personally, it’s my pick for best overall vegan lip balm, because every aspect of the product is strong. I’d like to go into more detail about it here in this review. All are from vegan sources, and there’s no sketchy or controversial ingredients like petroleum in it. Despite having fairly simple ingredients, it works really well, and lasts a fairly long time. You won’t have to re-apply it every 30 minutes like some others. I’ve seen very few cases of where someone didn’t like the smell of it, or didn’t find it effective. You won’t find many better lip balms (especially vegan ones) that do a better job.. I don’t consider the price of lip balm to be a huge deal because each stick lasts so long (provided you don’t lose it). However, it can still be a factor. Eco Lips is cheaper than almost every other vegan lip balm, despite being as high quality or better. The price fluctuates, and it depends where you buy it, but you’ll usually end up paying around $3 per stick. Compare that to another highly rated vegan option like Hurraw, which often goes for $7 or higher per stick. Clearly I’m a big fan of Eco Lips. It works well, has high quality vegan ingredients, and is reasonably priced as well. If you give a try, let me know how it goes for you in a comment below.